Judge this book by its cover (go ahead, it’s safe!). 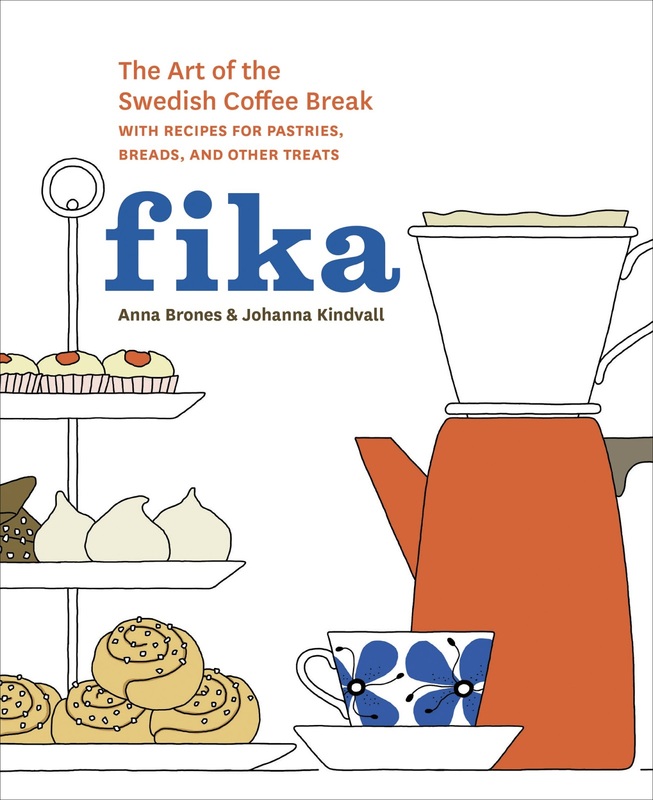 The cover illustration tells you everything to know: Anna Brones and Johanna Kindvall’s Fika: The Art of The Swedish Coffee Break, with Recipes for Pastries, Breads, and Other Treats is a book about coffee breaks done right (in the Swedish tradition). It's 25% lifestyle and history, 75% a cookbook, and 100% interesting. Of course, I would say that – baking is my jam. 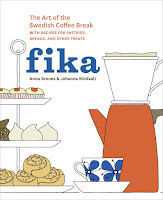 An illustrated lifestyle cookbook on the Swedish tradition of fika--a twice-daily coffee break--including recipes for traditional baked goods, information and anecdotes about Swedish coffee culture, and the roots and modern incarnations of this cherished custom. Sweden is one of the world’s top coffee consuming nations, and the twice-daily social coffee break known as fika is a cherished custom. Fika can be had alone or in groups, indoors or outdoors, while traveling or at home. A time to take a rest from work and chat with friends or colleagues over a cup and a sweet treat, fika reflects the Swedish ideal of slowing down to appreciate life’s small joys. In this adorable illustrated cookbook, Anna Brones and Johanna Kindvall share nearly fifty classic recipes from their motherland—from cinnamon buns and ginger snaps to rhubarb cordial and rye bread—allowing all of us to enjoy this charming tradition regardless of where we live. My dad’s family is Danish-American, but his mother died young, so no recipes traveled down that side of the family tree to me. I’ve always been curious about Scandinavia and its food, though. With the last name Larsen and as the shortest (at 5’10”) of a bunch of giants, it makes sense. When a Swedish cookbook popped up on my radar, I took note. I asked my library to order a copy. I then read it cover-to-cover and baked out of it and racked up $7.50 in library fines and put it on my wishlist so that one of my freakishly tall brothers can give it to me as a gift. Fika is arranged seasonally and traditionally (by traditionally I mean there are sections of the homemade favorites, the items you’d find mostly in a bakery, and then heartier items like breads at the end). While the focus is on baked goods that go with coffee, there’s also a fair bit about the slow, handmade, homemade traditions of day-to-day life in Sweden. I enjoyed the bits about history – where and how certain dishes originated, the proper way to enjoy them, suggested flavor combinations, and so on. But the star, of course, is the food. The authors included recipes that run the gamut from easy (a spiced shortbread cookie) to complex (holiday fare), with easy-to-follow instructions. Johanna Kindvall’s art brings each recipe to life. That’s a distinctive thing about this cookbook – there aren’t any photographs. Instead, Kindvall’s illustrations of the steps and finished product are the guide. And her art is both charming and informative. To “test” the cookbook I made 4 recipes: Nutmeg slice cookies, almond potato cake, toasted rye buns and soft ginger cookies. Since the focus is on “homemade” and slow living, the instructions don’t call for any intensive appliances (though there were some tools I didn’t have, but I got by with substitutes), but I used my mixer with no ill effects. Reading the recipes all the way through is a must – some of them take a day or two to complete! The nutmeg cookies turned out well and my book club devoured them: A-. The almond potato cake was a solid B – good when it came out of the oven, but not something I’d make again unless I have gluten-intolerant guests. The rye buns (I’ve never baked with rye flour before!) were fantastic: A. And the soft ginger cookies were GREAT, A+. Note: These recipes called for less sugar than American favorites across the board. I don’t have much of a sweet tooth, but it’s something to be aware of. The stars of Swedish baking seem to be nuts, cardamom and other “Christmas-y” spices – I don’t know if I’ve ever baked out of a cookbook with fewer chocolate recipes! It was kind of liberating. I look forward to making even more of these recipes in the future. Is it clear that I like this cookbook? I hope so. If there’s one thing I can point to as a “con” I’d say that the authors didn’t need to devote quite so many words to urging readers to slow down and savor their coffee breaks. That’s preaching to the choir. In the end I didn’t mind it, though, and I don’t think many will. In all, Fika is a beautifully illustrated homage to Swedish baking, with tasty recipes and tidbits about history and culture sprinkled throughout. I can’t wait to have a copy for my own bookshelf. Recommended for: anyone who likes to experiment with baking, those interested in international food traditions, and for the perfect treats to go along with a cozy cup of coffee. Well, I am very much a lover of coffee. I've never heard of fika though. The nutmeg treats sound wonderful and I absolutely love ginger cookies. Thanks for putting this book on my radar! I'll have to see if our library has it or if not, see where I could get it. I love coffee and Denmark so this book looks like a great match for me. Love your photos! Everything looks so good. Ooh, these sound good. And I always need more recipes to use up my Christmas spices instead of letting them sit all year. Almond potato cakes sound awesome to me, so it's sad they were disappointing. Ha, ha, as a Swede I know ALL about fika. Ask on! At work, for example, that's what you say when you go get a break in the afternoon: "Time for fika!". Unfortunately though, it does not always include cookies and such (or we would all be HUGE). But almost always coffee. If you meet somebody over fika though, or go to your older relatives, it's sweet stuff galore!